The ultimate kit for cheese lovers! 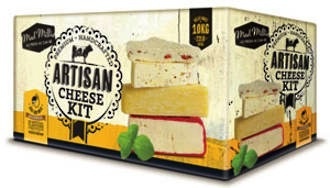 The Artisan Cheese Kit has everything you need to create an array of delicious fresh and aged hard cheeses at home. Just add milk! No artificial flavours and preservative free. 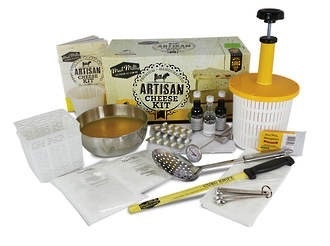 This deluxe beginners' kit combines our hugely successful Fresh Cheese Kit, Italian Cheese Kit, hard cheeses, a cheese wax and melting bowl and the hard cheese press. This kit contains all the equipment and ingredients to make up to 20 batches (10 kg in total) of cheese. Make: mozzarella, ricotta, ricotta salata, mascarpone, quark, cottage cheese, feta, goat's feta, goat's milk spreadable cheese, halloumi, light cream cheese and french style cream cheese, farmhouse butter, Chevre Frais, colby, cheddar, havarti, Caerphilly and Wensleydale at home! All consumables can be purchased seperately once used. Kit Includes: Hard cheese press, cheese wax and melting bowl, feta moulds (2), pipette, thermometer, small ricotta basket with container, vegetarian rennet tablets (20), artisan's cheese salt, calcium chloride, cheese cloth, citric acid, cheese mat, steriliser, mesophilic starter culture (MW3), curd knife, culture and enzyme measuring spoons, draining spoon, anatto colourant, instruction manual and recipe booklet. The mesophilic culture is shelf stable for 8 months at temperatures under 25 degrees celcius. However, we suggest storing cultures in the freezer when you get them in order to prolong the life of the culture. The culture contains a very small amount of dairy.